For this exercise, I tried to explore what subjects in which I already invested a considerable amount of time exploring. There are already so many different shows, music, artwork and games that I would say "this inspires me," so I tried to see how much I could come up without doing too much research. This allowed me to immediately recognize what draws my attention the most. Unfortunately this created an arrangement of somewhat ... immature subjects. Popular culture, cartoons, cheesy video games, and a sprinkling of fine arts. I see this as a sign of something going wrong in my exploration, but then I realized, this is the stuff I'm most passionate about, as evident by my daily rants and musings on these subjects. Also I had to consider that I did not make any cards regarding technology, in order to adhere to the parameters of the exercise. Therefore I say I am in good shape: most of my inspirations come from very cool developments in entertainment media and computing, and in order for this kind of media to persist, somebody has to make it better! This exercise eliminated my suspicions of verging down the wrong path. The interest cards essentially served as qualifiers for my inspirations. Basically if I had some inspiration cards that I found questionable, there was always an interest card that illustrated some intriguing way to explore themes expressed by the inspiration card. My interest cards, while I made many and they cover several fields, most of the cards effectively "collapsed" down to a few "core" interests, as I explain in the next exercise. I have a difficult time making decisions, so having interests that could easily fit together made my life significantly breezier. Some of the interests even helped form insightful questions that could focus my potential research topics. For this phase, I hunkered down and pick some interests to further investigate. Out of my twenty interest cards, I selected three that seemed the most concrete and easily modified by other interests. I consider these the "core" interests on which I can combine others. I have completed quite a bit of work regarding board games. Much of my undergraduate extracurricular life was dictated by board games. I have made my own board games. Fundamental knowledge of game design comes from an investigation of some of the oldest, traditional forms of human entertainment, and that I find intriguing. I got kind of lazy and decided to lump haptic feedback, motion capture, alternative game controllers and other interests into "physical interaction" with computers. The next "big thing" in computers, I believe, will either be some kind of revolutionary artificial intelligence, a breakthrough in statistical analysis, or a shift in how humans operate these wonderful machines. Such an exciting subject! The last one... consider it both a guilty pleasure and a passion. I love huge machines. Ever since I was a wee, wee lad, I was obsessed with trains, airplanes, cargo ships and of course, giant robots! My obsession waned as a grew older, mostly due to the lack of quality media offerings (aside from those listed on my inspiration cards) and diminishing promise in the viability of massive humanoid mecha. However, if there's a subject that I would be excited to work on for a year and create something fantastic from it, you bet it's option number three. I researched these three topics over the course of two days, and was quite surprised by the amount of resources I found from a simple Google Scholar search. I haven't even begun to search the library yet. I'll spare the details and instead link you below to my notes and findings on my Evernote account. While on my long New York commute, I ran through multiple possible claims I could attempt to defend according to what I researched so far. These three selected seemed to stick the most and sound the most intriguing, while also incorporating some of my other interests. Board games Board games with integrated computer technology will create a superior combination of accessibility, immersion and social interaction in a gaming context. Physical computer interactions Greater emphasis on both physical feedback and physical input in electronic media will create more immersive, enjoyable and effective experiences while encouraging more physical activity. 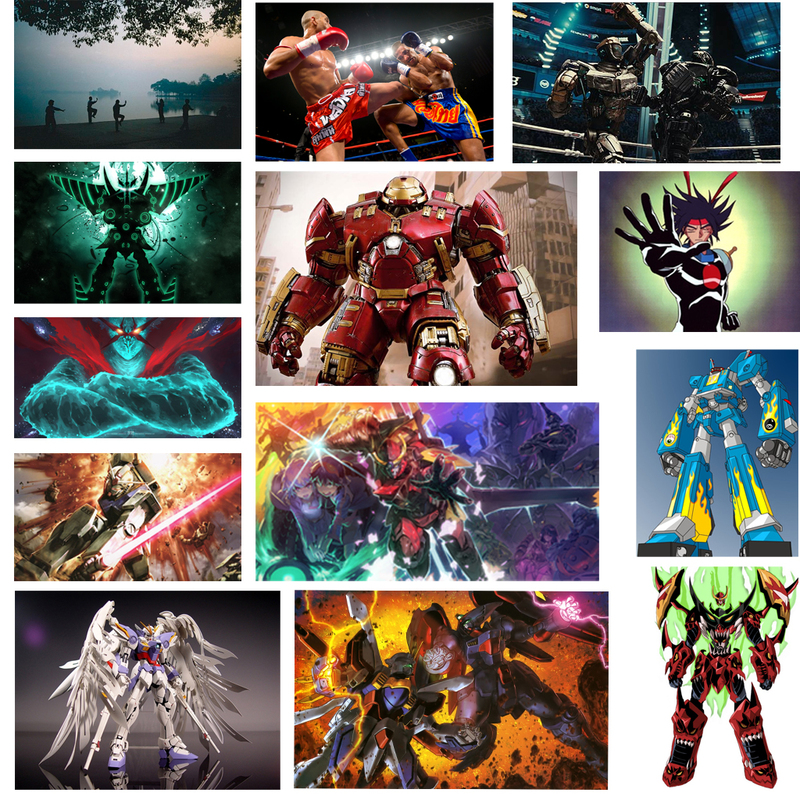 Giant robots Because of the cultural context of giant robots and growing popularity of VR, a competitive fighting game with motion controlled mecha avatars would capture a level of enthusiasm akin to traditional sports and revolutionize spectator games. Aren't board games outdated and boring? How can they create "superior gaming experiences"? Part of what makes board games special are the physical elements (pieces, cards, dice, etc). Wouldn't replacing physical elements with virtual versions contradict the point of board games? How much of the game would be replaced by technology and still maintain all of the good qualities of board games? If a game can be completely digitized (and most have), why is it worth keeping some physical elements of a board game? How would increased accessibility affect current board game enthusiasts? Is the lack of accessibility due to the games themselves or is it simply the often toxic community that surrounds board games? How can this be fixed with technology? Board games is a dying market and very hard to get into. Why attempt it? What kind of non-gaming applications would there be? How could more physical feedback be the solution to motion sickness in VR? Why would someone spend a lot of money for a more physical gaming experience rather than something more standard? How could more physical interaction with games overtake and become the status quo? As seen with the reception of the Nintendo Wii, how can physical controlling move beyond novelty and into a realm of either necessity or usefulness? How does one overcome the desire to just sit down and play video games? Could physical gaming become a viable form of exercise that would be taken seriously? How could physical interaction in games become part of competitive games like those played in eSports? Making games require physical skill to play would decrease accessibility. Why would this be good/bad to pursue? Can making games physically demanding make them more appealing to those seeking more of a challenge or to find alternative exercise solutions? Some research has been done in the field of rehabilitation regarding this topic. Could this indicate promise in improving the fitness of gamers? How can I overcome cliches (or even overdone deconstructions) surrounding mecha? Would the motion controls make the game any more enjoyable than the same game played with a traditional gamepad controller? Would the motion controls create a greater barrier of entry and learning curve, thus diminishing accessibility? Concerning the style of game proposed by this topic, why go with robots at all? Wouldn't human fighters be more appealing? Is this even feasible to do in the slightest? What technology is available the would accomplish these goals? How would the cultural and historical implications of mecha contribute to a positive experience in a fighting game more so than human fighters? How can VR enhance the established ideals of mecha, such as towering height, power and mobility? Mecha in popular culture emphasized human ingenuity, engineering and relationship between man and machine. How can these themes be executed better through a motion-capture interface? How could this type of game be constructed to make it something of higher artistic/aesthetic value? Is there an opportunity to pull off some kind of "curveball" pitch -- something that no one would imagine in a game about giant robots (refugee crisis, climate change, consumer-capitalism)? Why pursue alternative controls? Why couldn't a normal gamepad suffice? 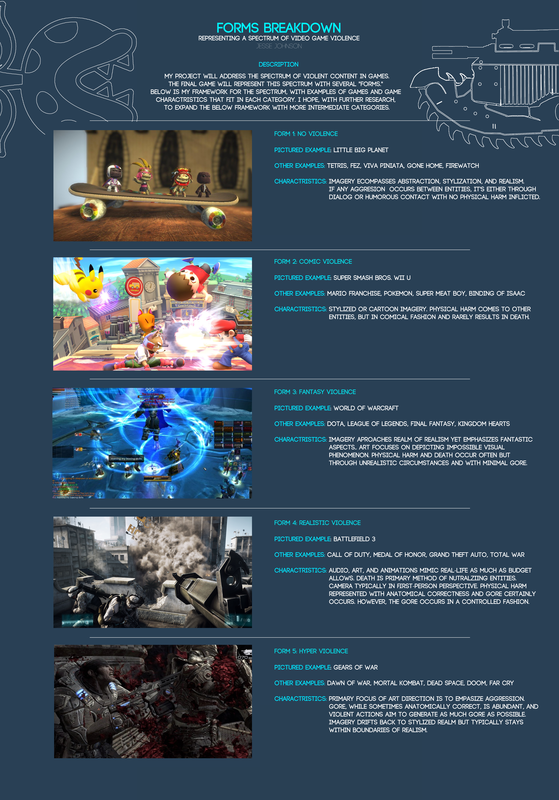 What would be gained from motion controls and VR? 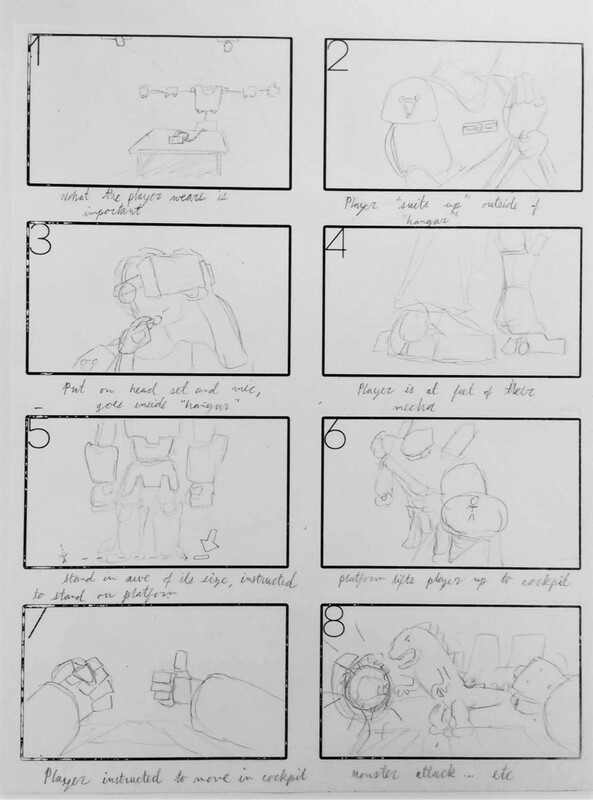 What is better to pursue in this project: aesthetics of giant robots or mechanics of piloting a fighting machine? Here are my top three topics, each associated with their respective top three accumulative questions. Each square represents a particular path of research, marked with a number indicating my interest in the question, 1 being least interesting to 10 being the most. I made a presentation to express my ideas. Don't get excited, it's a Pecha Kucha and won't make sense unless you see me present it. In the book The Craft of Research, author Wayne C. Booth encourages the aspiring researcher to phrase their topic in what he calls the "three step formula"
Topic: I am studying _________. Question: because I want to find out what/why/how _________. Significance: in order to help my reader/audience better understand _________. 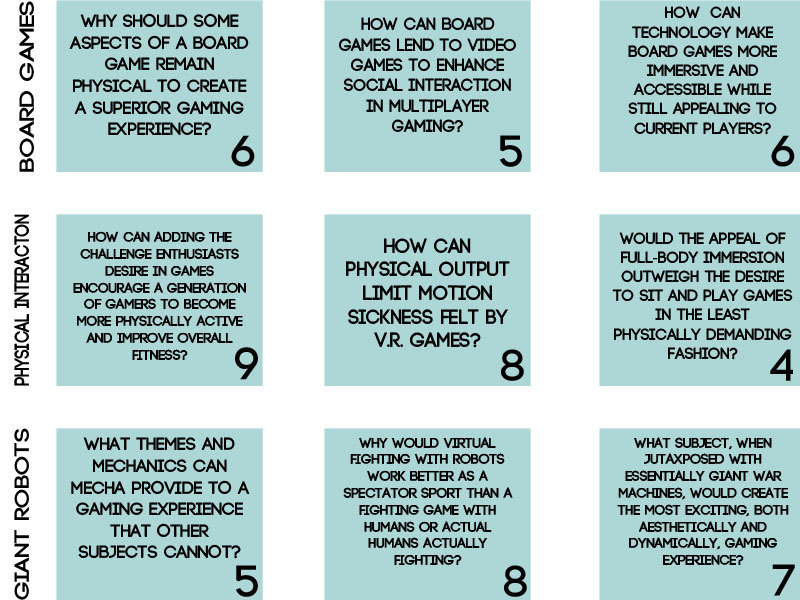 I am studying integrating technology and board games because I want to find out how to make in-depth board games more accessible while maintaining much of the physical aspect of board games in order to help my audience better understand the importance of human interaction and physical presence in gaming experiences. I am studying physical input and feedback for computers because I want to find out how to incorporate physical challenges in a game setting and build more immersive VR experiences with diminished motion sicknessin order to help my audience better understand how incorporating more physical movement in games makes for a much more satisfying gaming/VR experience. 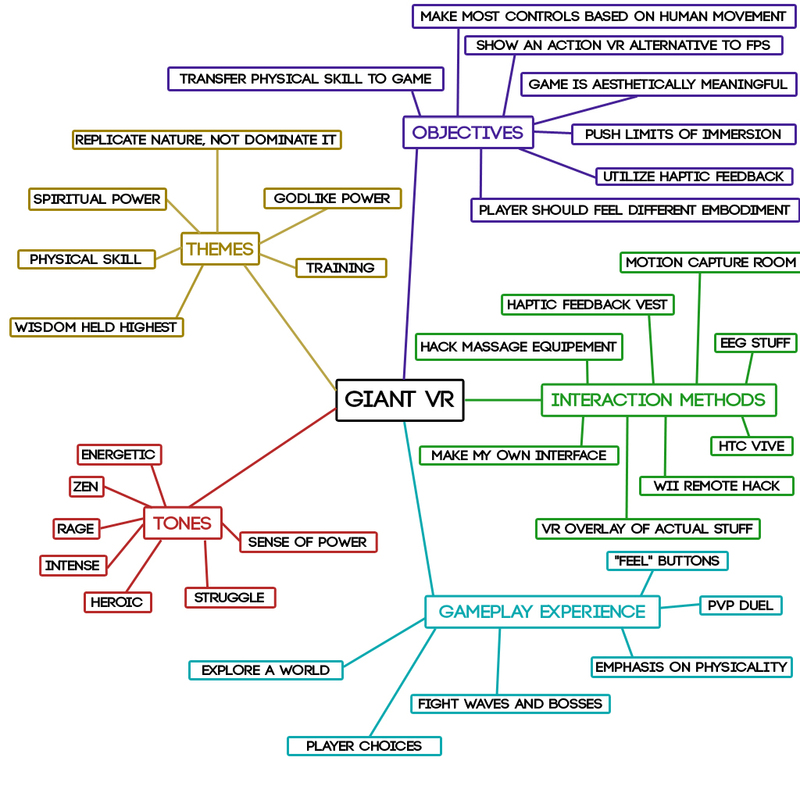 I am studying giant robots because I want to find out how to create a fighting robot VR experience that is exciting for the participant and viewersin order to help my audience better understand VR as a way to make particpants into something awesome instead of simply putting the participants themselves into a game. With what I have seen, the question I want to ask seems to already have been answered, but not to the level I want. Yes, tech makes board games essentially more fun because focus shifts from making sure you counted your moves or points correctly to the other players and the interaction between the players. The False Prophets study and game was fascinating, and basically nailed what I wanted to accomplish. My only issue with the study was the use of a tremendous amount of technology. For 2002, what they accompished must have been astonishing. Today, there would be too many components and look very clunky. An entire interactive display as the game board? 14 years later, and nobody has that kind of interface available, save for the elite few who do. Their approaches were intriguing, such as using the tech to open up new possibilities for game play in a board game setting like data collection and dynamic puzzles, but the amount of tech seemed a bit much. However, what they tried to accomplish could easily be done with smart phones, which nearly everyone has. My initial research has also shown the value of collaboration in board games. Competition keeps much of the game in the players' heads, which eliminates most of the reason one would choose to play a board game over a video game: human interaction! The best results came from games that gave players the ability to perform better than other players, but made interaction crucial to victory (like Settlers of Catan). Ancient games revealed the longevity of certain mechanics, such as dice rolling (luck) and piece placement (skill). This research also showed how unenthusiastic I am about the project, as well as how unenthusiastic anyone else would be. This topic has been covered a lot. The only way for this endeavor to be interesting would be to create a mind-blowing board game using widely available tech that anybody could use. The more impressive the tech, the less reason to implement it in a board game setting. My primary take-away thought: if the tech used is truly impressive, then the resulting product might as well be a video game, as impressive tech is not the point of the board game and impressive tech is hard to set up. Tech used in a game should make the game more accessible, NOT less! So what would be wrong with using a cell phone? Again, the focus of the project then would be the game, not how the game was made, which puts a lot of pressure on my talent as a game designer. Tons of board games out there use some kind of cell phone interface, but I can't personally recommend any of them. In order to make the project interesting for me and others, I would have to make a game that proves the validity of using tech in a game, and the tech would have to do something mechanically interesting and not simply a calculator. An exciting venture, yes, but not something I want to hinge my masters degree on. Perhaps I'll look into it once I have more experience making games. I skipped 2 for now for clarity purposes. The more and more I look into this subject, the more excited I get about it. But first, I want to address my problems I have. Most of my academic articles focus solely on Eastern (exclusively Japan) versus Western perceptions of robots in general. This is a very fascinating topic, as it verges into the realm of sociology and anthropology with a backdrop of technology and a dash of philosophy. My issue is how I make this into my thesis project. Regarding the Three Step Formula, I can't quite address specifically a question for or the significance of the topic, other than "knowing more about the historical reasons why Japan likes robots and everyone in the west is scared of them helps my audience understand the world post-WWII." I understand how this is a very important topic, and because of its importance, I would not be adequately portrayed by an entertaining experience, which is the intended goal of this topic. With the information I can actually gather about the topic of giant robots, my topic would have to be about Japan versus the West in order to be effective. I want the project to be a about creating an experience, not a compare-contrast analysis of sibjects. With that in mind, I can look at the specific themes and influences of giant robots and use those to create a VR experience. Perhaps I remove robots and replace it with monsters. "Godzilla, Durkheim, and the World-System" touched upon interesting ideas about relating monsters like Godzilla to the old ideals of dragons in Japan, which were used as a symbol of hegemonic power. The dragon comparison extended to this idea of incomprehensible power, power that humans were doomed if opposed to it and victorious if protected by it. Giving someone that power would be an awesome VR experience. I am also interested in investigating a point made by Crispin Freeman (voice actor in several anime series and games) about the Shinto and Buddhist influence on Gundam and other warrior-robot anime. I would like to know more about that and how I could included that in a VR game. It turns out there's much more to giant robots and monsters if I look at the subject from an analysis of Japanese culture. I would still love to do project about a competitive giant-robot game, but there's not much to think about giant robots outside of the realm of Japanese warrior robots and Kaiju, which have a tremendous amount of history and opportunity for cultural analysis. Western portrayal of giant robots have simply been walking tanks because the focus is solely on war. Post-war Japanese popular culture was more interested in the pursuits of civilian science, or fighting unimaginably powerful and evil monsters. Whenever war became the subject in Japanese media, it was always in a negative light, whereas Western portrayal was almost always positive. Again with the compare and contrast! If I pursue this topic, in order to make something fulfilling, I would need to focus on Japanese subjects. This topic makes me a little uneasy because of its heavy engineering focus. From what I gathered from the research, people have been working on this idea for decades and still have not made anything that would do what I want to do, which is give the user realistic depictions of force feedback from virtual environments. I wish I was an engineer, because such an endeavor sounds exciting, but I only have a year to pull off my thesis and that's not enough time to learn how to prototype very sophisticated game controllers from the ground up. The best plausible examples come from putting an actual, familiar object into the game world and simply use the physical analog of that object in the real world, such as peddling a real bicycle to operate a virtual bicycle. I'm sick of first-person-shooter applications for VR, but The Void is a very good example of providing a physical world that servers as an analog to a virtual world. What I would like to create is some kind of interface that pushes the user back. This could be accomplished with machines similar to those found in most gyms. I have access to a motion capture studio, so that could be a possibility. That said, one of my main goals for any kind of development is to keep things accessible. A $30,000 mocap room is the opposite of that. 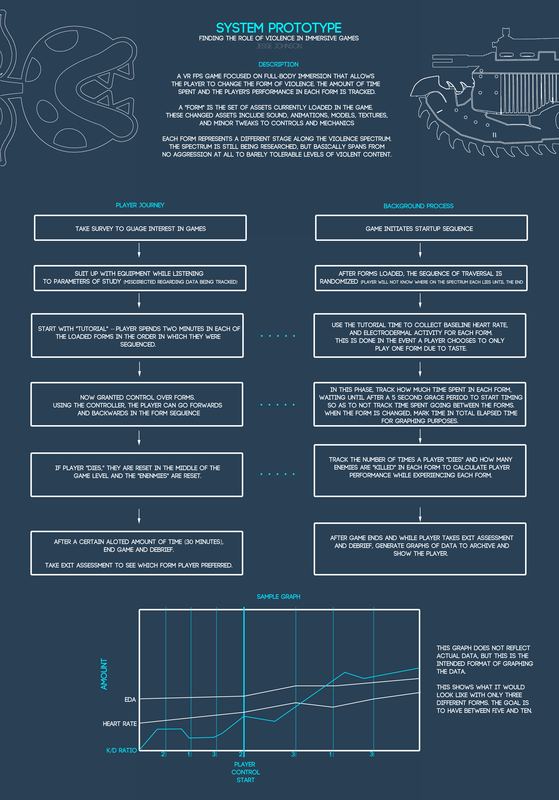 I also wanted my topic to explore how to use force feedback as part of a game's challenge, a challenge that must be over come through actual fitness training. Instead of gaining XP to "level up," you "level up" when you can run a mile in 7 minutes, or when you can bench your body weight, etc. The research did not reveal much insight into that topic exactly, but tangentially through the work of physical therapy. The activities involved in therapy are "boring," as quoted by the experts. To make them more appealing, doing the exercises regularly and correctly provided rewards in a game environment. One of the TED talks I watched had an excellent presentation of several examples of using games to encourage seniors to do low-impact exercises and children recovering from surgery to perform their daily rehab routines. This shows the level of potential in incorporating games into exercises. I began to struggle with the giant robots topic even though I really enjoy the path I could take with that. I believe there could be a very interesting way to merge the two together. 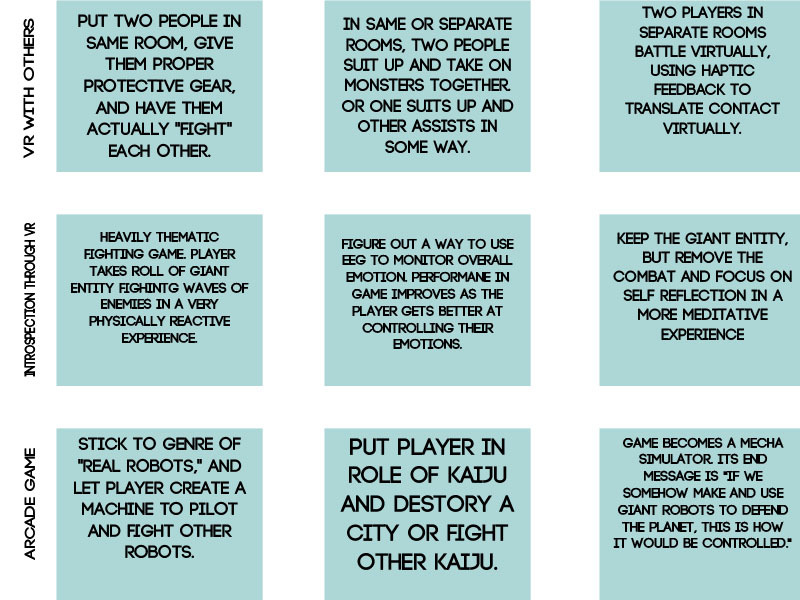 I can look into making an almost "spiritual" environment using the themes surrounding kaiju and mecha from Japanese media, using competition and engaging gameplay to encourage bettering the players' physical fitness and form. The game play and feel very physical. Pseudo-haptic feedback techniques I read about could be very useful for this. Every action the player executes and every blow the player takes should have physical consequences that are actually felt. I want players to come out of a game, look at each other, and say "that was intense." I am studying physical input and feedback for computers because I want to find out how to make a VR experience be as physical and intense as possiblein order to help my audience better understand how physical presense and force is critical for creating truly fulfilling VR experiences. I am studying Japanese kaiju and mecha culture because I want to find out how to incorporate the spiritual influences and the significant themes in a VR experience in order to help my audience better understand what it's like to have that kind of power. I made another presentation to express my ideas. Another Pecha Kucha. This is the link. I investigated the history of my selected topic idea and compiled the important events regarding the topic into a timeline. These are the events that make my idea possible or led to my inspiration of it. For this exericse I created some mood boards, story boards and a mind map of my topic idea to get a better image of my intended direction and explore other paths I may not have realized. I started a reading list on Amazon. I'll keep adding to this as more relevant titles come to my attention. Here's my list. I now rewrite, update, refine, an expand upon my question, which now exists as a mash-up of questions 1 and 2. How do I make a VR experience be as physical and intense as possible? How do I capture the spiritual influences and the significant themes of Japanese mecha and kaiju media in a VR experience? First, let's get rid of the sexual tension and just merge the two already! How do I make a VR experience be as physical and intense as possible and capture the the spiritual influences and the significant themes of mecha and kaiju media? This is quite the mouthful. The wording should be crafted into a more elegant sentence. "Intense" is quite vague here, and also sounds a tad trite. I can do better. The topic as a whole can sound trivial and immature to a more refined audience and astute thesis board members if not handled correctly, so I need to make my question sound more robust and worthy of a master's degree. 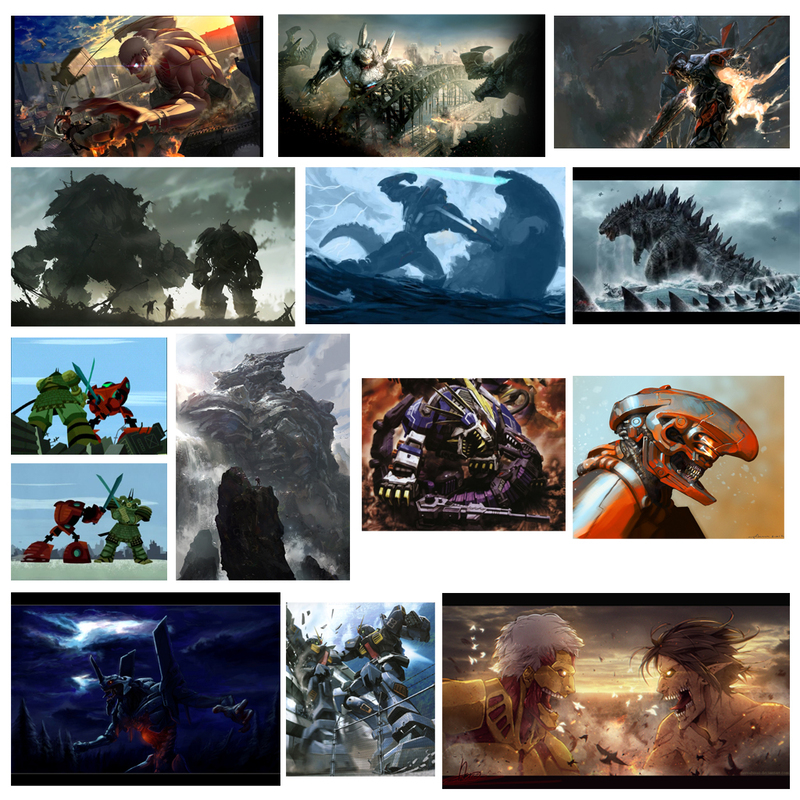 The two things I want to explore with my topic are the key themes of mecha and kaiju and how to make a very physical VR experience around these themes. The end product should incorporate VR technology and physical feedback devices that best emulate the mecha/kaiju experience in the most aesthetically significant way. My question should clearly address this objective. how do I best characterize the historical and cultural themes contained in Japanes mecha and kaiju media using VR and physical gameplay? 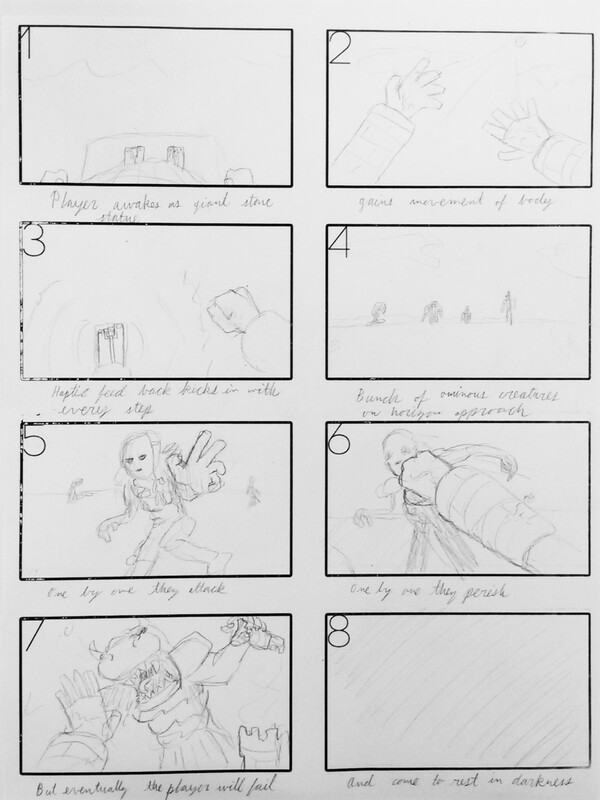 Here is another grid of nine, this time framing 3 different concepts for my topic, each with three possible outputs. I made a write-up of my initial research, which includes an exploration of fields and domains, looking at external guidance, and summaries of books. I didn't want to put another wall of text on this page, so I'll give you the link instead. Have fun. As the time for actually thesis work draws closer, I needed to reevaluate what my topic actually is . Here is a link to an updated outline of my topic trajectory. ta da. After finally seeing the pile of information I had accumulated, I realized I was headed towards committing to a bad project. Fortunately, I have quickly rebounded, and have found a much better topic that still falls in line with my interests and some of my previous research, but will require much more new research. I will now look at violence and aggression in entertainment media, with a focus on cultural analysis of video games. I want to learn more about why a great number of people find violence fun in games yet remain morally deposed of real-life violence. For this week's exercise, I have constructed a minor prototype to illustrate the high concept of what I've looked into so far on this topic. I constructed a small, competitive game between two players. Each player controls a simple avatar that shoots projectiles. The player who hits the opponent with a projectile first wins. Pretty standard, classic game mechanic. What I have added is the ability to quickly change through aesthetic modes. The game has three aethetic modes: pure abstraction, over-the-top monster fight, and realistic aggressive shooter. All three modes have identical mechanics, but completely different art assets and music. This aims to explore how the exact same game can evoke different emotional responses based on the context of its themes and art style. Playing in one style might even be more fun than playing in another. Also the game aims to show how all three aethetics still overlay what is essentially an aggressive competitive game, and still has the feeling of "shooting for a kill," even in its most abstract form. Play the game in your browser here. Xbox controllers are recommended, but keyboard will do as well. . Here is a flow chart of my current thinking on the project and a path towards two possible end products. 1. Would you consider the games you play immersive? 2. What is the most amount of immersion you experienced, and what was the game title, if it had one? Like interface, graphics, etc. 3. What does immersion mean to you? 4. Has immersion ruined a game for you? What game? How? 5. In games you play, what is the role of violence? 6. How important is violence or aggression in the immersive games you play? 7. For you, is violence more for narrative or entertainment? 8. Think of a violent game you really like. What would the game look like without the violence? 9. Has violence ruined a game for you? What game? How? I conducted this simple exercise to really gauge interest in the topic and see where people stand on violence as entertainment. I opted to use handwritten responses to get people to really focus on their answers and so I could interact with the participants face-to-face. I did not learn a tremendous amount during the pilot session, simply that I had a typo in one of the prompts and that there lacked balance between the open response and binary (yes/no) questions. The pilot session did, however, indicate how the general audience would answer the survey. The majority of participants were pro-violence in games, and many expressed how important violence is to their gaming experience. Some went as far to say that violence was the key component to their fun in video games. Those who said they did not violence in games were pretty passionate in their responses; it seemed like they wanted me to know just how anti-violence they were, like they wore it as a badge of honor. What I found interesting with the responses was the diversity in people’s regard for violence in video games when they liked violence, but people who said they did not like violence had very similar responses. Violence makes stories more compelling and immersive Violence, in games, is a mechanic. How violence is handled in a game often defines that game. Games of interest with violence typically had a competitive or cooperative multiplayer element, with slightly more preference for competitive. Violence makes video games, something that had for decades been seen as a pastime for kids, more mature. 9 was a mixed bag, and many people left it blank, but the responses I received for 9 identified other important elements to consider: People generally like violence, but many are uncomfortable with gore or controversial actions Context is important- the violence needs meaning or an objective Some expressed violence hurts their game experience when it either becomes too grounded in reality, such as depicting terrorists or mass shootings, or incredibly over-the-top as seen in Mortal Kombat or Grand Theft Auto To improve the survey, I need to reassess the immersion questions to get more information. Most had the same thoughts on immersion, saying immersion is what makes people get more “into” a game. The language surrounding the answers ranged from “immersion makes the game more believable,” to “immersion helps forget about or block out the real world.” Only one person had an answer different from”no” on question 4. I need to ask at least one question about identifying as the player character in violent games, to identify any discomfort being the agent committing violent acts. I also need to better address the spectrum of violence in games, which plays a significant role in my intended end product. Question 9 almost accomplished this, but only identified the extreme end of the spectrum. What I would like to do next is make a categorization exercise to rank violence. I would have participants list 6 games from least violent to most violent. I'm trying to figure out how to spin the exercise so that I can get more insight into which part of the spectrum popular taste lies. 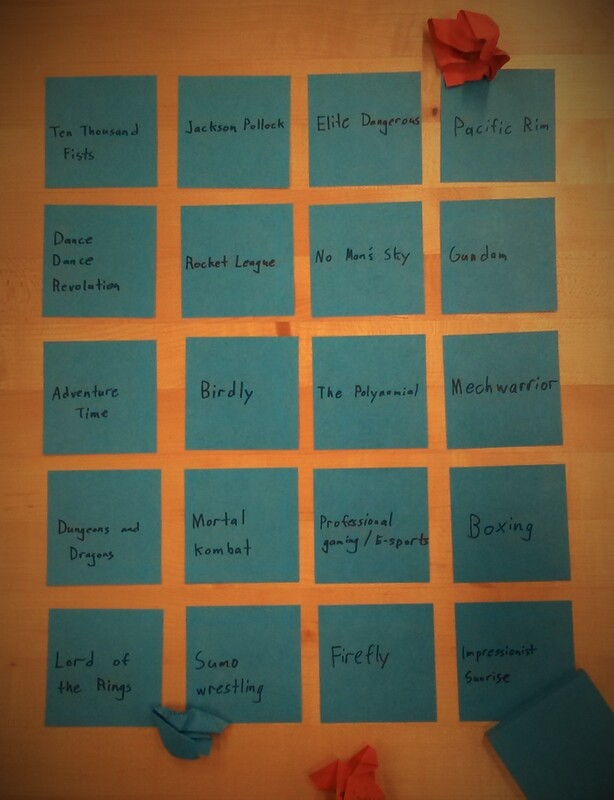 A method I'm playing around with is after filling in the 6 slots with game titles, I ask the participant to pick their favorite game. I would also investigate the Metacritic scores of the games they listed to inspect the public opinion of those games. note: there will be a link to the completed surveys (that received consent to be published) once I have them all scanned and uploaded. 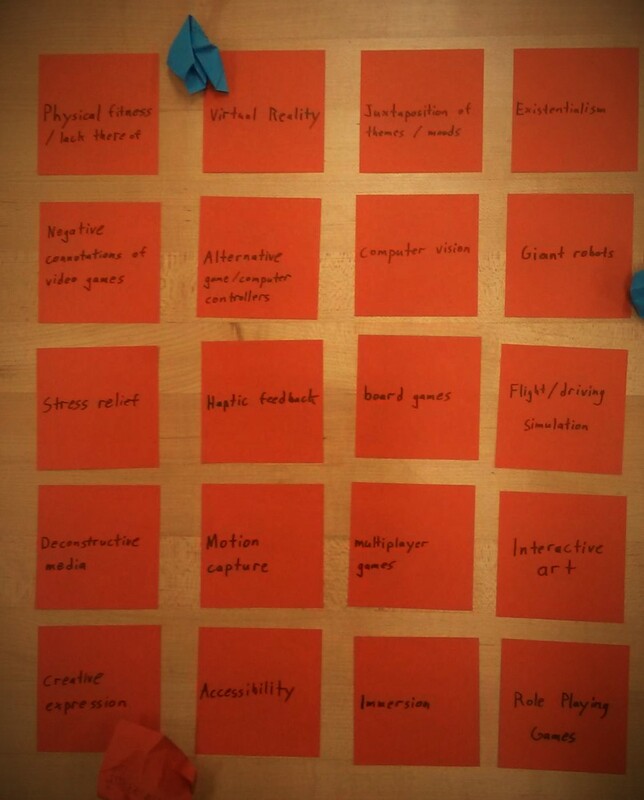 With the help of a focus group made up of a diverse selection of self-identified gamers and game designers, I constructed two system prototypes that visually breakdown what my project will look like. First, below is the overall system diagram, which explains how my intended project will function. Second, this is the categorization of the forms addressed in the previous diagram. It will clear up exactly how I intend to differentiate forms along the violence spectrum I am currently constructing I hope to bolster this framework in the near future with further research.